Days after Hurricane Harvey first hit Texas, residents are bracing for more flooding as the storm makes landfall once again. From tragic deaths to destroyed homes, Harvey has left behind a trail of devastation. The hurricane, which first made landfall in southeast Texas on August 25, has been dubbed "one of the largest disasters America has ever faced" by Governor Greg Abbott. Pictures from the scene have tugged at the heartstrings of people across the globe, showing tears cried for lost loved ones and piles of rubble where homes once stood. However, the destruction is far from over, as Harvey - now a tropical storm - made landfall once again early Wednesday. So far, 19 people have been confirmed dead as a result of Hurricane Harvey, with local officials cited by the New York Times saying that at least 11 others are presumed dead. Among the fatalities was a family of six, four children and their great-grandparents, who were swept away in Greens Bayou while inside a van that was trying to rescue them. One of the family members, 16-year-old Devy Saldivar, posted on Facebook before she met her tragic fate. "No sleep & anxiety, please let this pass sooner," she wrote. Other victims of Hurricane Harvey included 89-year-old Agnes Stanley, who was found floating in four feet of floodwater inside a home, and another elderly woman who was discovered floating near a vehicle. Steve Perez, a 60-year-old veteran Houston police sergeant was also among the fatalities, after spending two and a half hours trying to get to his duty station, according to Houston Police Chief Art Acevedo. When Perez's wife asked him not to go into work due to the conditions, he responded by saying "We've got work to do," Acevedo said in an emotional press conference. Harvey first touched down in Rockport, Texas, on Friday. 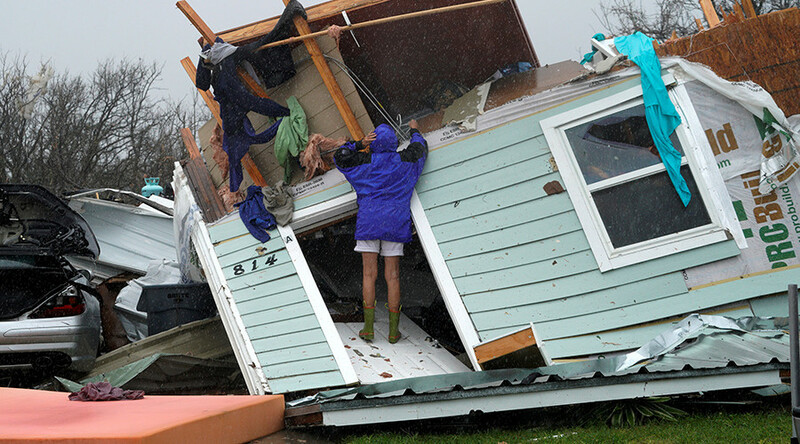 The town of nearly 11,000 people quickly fell victim to the most powerful hurricane to hit the state in decades. Hundreds of homes, businesses, churches, and government offices were destroyed or damaged. Some 200 miles northeast, Houston, the fourth most populous city in the United States, also received some of the worst Harvey had to offer. Tens of thousands of homes in and around the city are semi-submerged, and thousands have sought emergency shelter. Roads turned into rivers in the city, as Harvey dumped more than 50 inches of rain in parts of Houston, breaking all records. preventing property crimes, such as looting, on evacuated homes. Curfew in force only to prevent potential criminal acts. Brazoria County to issue a warning on Twitter which read: "NOTICE: The levee at Columbia Lakes has been breached!! GET OUT NOW!!!" More than 13,000 people in southeast Texas have been rescued by local and federal agencies since Harvey hit the region, according to the Associated Press. Everyday citizens have also stepped in to help those in need, rescuing strangers from their flooded homes. Local news reporter Brandi Smith was seen flagging down a Harris County Sheriff's vehicle live on air after she spotted a truck driver whose cab was submerged in water. The driver made it out safely as a result. Incredible stories of pet rescues have also emerged, with both owners and strangers doing all they can to make sure the furry friends of Houston are kept safe. One particular case tugged at the heartstrings of animal lovers, after a news reporter tweeted a photo of a dog that had been abandoned by its family. The dog was ultimately rescued. Houston shelters are bursting at the seams, as hundreds of thousands of people have been ordered to evacuate their homes. Houston has been criticized for its lack of preparation, partly because over 38,000 acres of wetlands - areas which act like sponges for excess water - have disappeared in and around the city over the past two decades, according to a 2015 report from the Houston Chronicle. Many developers have ignored a federal policy which requires that new construction cause "no net loss" for wetlands. Ignoring that rule has had serious effects for Houston, which has seen a construction boom in recent years. The increase in water-resistant surfaces such as concrete has led to the drainage systems being overwhelmed. Houston's Fort Bend County had a 53 percent increase in such surfaces between 2001 and 2011. Most of the functioning drainage systems were built in the early 20th century, and are designed to withstand much less severe flooding. Meanwhile, building regulations also haven't taken into account historic flooding levels - meaning most structures are incapable of handling the vast amounts of water that Harvey dumped on the city. Geography is also a contributing factor, as Houston is low-lying and most of its soil is clay, which drains poorly. The city is also very flat, leaving the water with nowhere to go. As Texas continues to come to terms with the wreckage left behind by Harvey, Louisiana is now bracing to become the storm's next target. Harvey made its third and final landfall in southwest Louisiana, near the Texas border, Wednesday morning. Weather experts have warned residents to brace for as much as 6 to 10 inches of additional rain, with the National Hurricane Center warning that "ongoing catastrophic and life-threatening flooding will continue in south-eastern Texas." The city of Port Arthur, Texas, has tweeted for help, saying that "individuals with boats" were needed for rescues. Individuals with boats are needed in Port Arthur for rescues. One photo posted online by a local news outlet showed that a shelter had been flooded, and said that residents are waiting to be moved to another location. Houston is expected to see less than an inch of rainfall on Wednesday, with around a 30 percent chance of showers and thunderstorms on Thursday. After days of torrential rain, a glimmer of sunshine could be seen on Wednesday. The SUN is out in Houston! But the dark cloud left behind by Harvey still remains, with experts predicting tens of billions of dollars in lost economic activity and property damage across the region as a result of what is likely to rank as one of the nation's costliest natural disasters.